Grades are familiar to every modern consumer of education. These days, coaches in many sports make constant references to how performance “grades out” on video. For most soccer fans, winning is a typical criterion. Bethlehem Steel fans know winning is, in fact, not the only thing when it comes to grading the Steel. Primarily, the following unscientific, idiosyncratic observations attempt to compare Steel players to their peers in the USL. All goalkeepers need to buy “Mr. Post” and “Mr. Bar” dinner, periodically and repeatedly. Lubrication, net cord and paint are the recommended menu. When the first choice back four are together and fronted by the first choice central midfielders, they can legitimately hope for a clean sheet against most teams in the Eastern Conference. Only Red Bulls II in the second game of the season took them apart badly. The Toronto FC II game consisted of three correctable individual errors. Auston Trusty: The recent Philadelphia Union Academy graduate is Bethlehem’s first choice left center back when available — and his 18th birthday is less than a month away. Trusty is in the pool of candidates for the USMNT U-20s and has practiced all season with the Steel, not the Union Academy U-18 side. He has the strength physically and mentally to stand up to fully grown adult male professional strikers and the pace to run them down. It is likely that playing next to Daly has helped him learn. He has meaningful upside. B for performance, an A for potential. Anderson: The Brazilian loanee is flawed as a USL defender. He is neither fast enough nor quick enough when facing good quickness and pace. Guile, experience and good initial positioning can only do so much, especially since the Steel try to possess the ball in a compact shape with their defenders up at midfield, exposing quite a bit of grass behind them. B+ for everything but speed and quickness, a D for speed and quickness. Nick Bibbs: A substitute defender and midfielder until the Daly loan, he has stepped into the lineup as starting right center back since Daly’s departure. He has defended well but distributed with painfully uncertain conservatism. He began the season injured. It is likely that his ceiling is well known and he is not intended to be much more than a role player in the long term. Now, very tentatively, he earns a B for his defensive play, a D+ for distribution. One of these two has primary responsibility for the space in front of the center backs. The other is supposed to join when the Steel lose the ball but also ranges further up field more frequently as more of a box-to-box player. Dividing soccer’s offense from the defense violates a fundamental principle of the game established as gospel at least as far back as Rinus Michels, Johan Cruyff, and Johan Neeskens in the 1974 World Cup with the Dutch Whirl, aka Clockwork Orange. The principle is total football, or total soccer: everyone a defender, everyone an attacker, all of the time. These days only the center backs restrain their participation in the attack during the run of play and that only until Emergency Time in a game in need of a goal. And defense begins with the striker. Witness Corey Burke and C.J. Sapong. 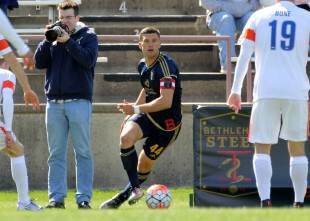 The Steel have used both the Bethlehem core roster and Union loanees in the offense, as well as some Academy youngsters peripherally. The first teamers start when available. Over time, the game day mesh among the groups has improved. Scoring has been a weakness of the Steel so far this year. They are tied for sixth fewest in the 29-team league, with 23 in 20 games. League leader “Los Dos,” aka, LA Galaxy II, has 40 in 19. Only three offensive players have clearly won positions. The rest remain in flux. While they interchange with one another as a result of corner kick and free kick assignments, the Steel’s flank mids’ positions can be predicted. Gabe Gisse: A young, pacey left flank midfielder with decent technical skill who can get to the end line to penetrate or distribute. Usually, he is a substitute. He has subbed at striker once. He does not shy away from tackles, often taking his mark by surprise with decisive courage. He needs to grow physically and mentally. He seems likely to have upside. C+ for current performance, B+ for potential. Justin McMaster and Raheem Taylor-Parkes: They have had cameos as substitutes, each earning I for Incomplete. Leo Fernandes: He has made his most positive contributions to the Steel as a flank midfielder. His time as a No. 10 has been more mixed. He integrates well with other technically skilled, intuitive soccer players. He does not show himself as the linchpin for other players of lesser skill and understanding. He does not seem to make these others better. B as a flank mid, C- as a central attacking one. This term of art better fits the organization’s insistence that all ten field players have defensive responsibilities better than does “withdrawn striker.” Creating chances by passing, dribbling, running off the ball — “creating” is the key offensive emphasis for this man. In the earlier parts of the season, the Steel did not have a clear one. Now they do. James Chambers: Chambers has become the first choice Steel attacking center mid. Aside from his lack of foot speed, he is the Steel’s best technical player. He uses his brains and experience as one of the team’s elder statesmen to overcome his pedestrian pace. He shows intense passion to win. He can play all three central midfield spots. Recently, he is most often the furthest forward. One of these days the invisible barrier across the goal will break for the team leader in shots. Not even shaving his beard has broken his luck. A+ for everything but speed, C (at best) for speed. Strikers are the goals scorers. They also start the defense the way the Curt & Earnie playing style template works. Three Steel players and one first team loaner have played this position, aside from peripheral improvisations. There are many styles of striker. The Curtin-Stewart template calls for a single strong, technically skilled aerial winner who can win and hold the ball away from the defense while the rest of the team transitions into the attack. Appreciate the update and observations as I can’t watch as many BSFC games as I would like. I miss that goof Ayuk every day. He should be back stateside. Communications from the Union communications people concerning the Steel do not clarify his current status for Saturday and Sunday, appropriately as his status is determined by the first team, as, now, is Jones’s. Unauthorized Bethlehem Steel FC blog, if you haven’t already noticed, has been following his Cameroonian adventures closely. I commend their archives to your attention. Appreciate the way you have given an individual grades to all the different Bethlehem Steel FC players … Back in the day, before squads became so large that such a task got to be a little too much, there was a popular German soccer magazine that used to give a rating to each and every player in the Bundesliga with the four categories being “World Class”, “International Class”, “Bundesliga Class” and “2.Bundesliga Class” … With that in mind, I’d be interested to see all 36 players currently listed on BSFC’s roster at the USL’s official website given a rating of either “Legitimate MLS Prospect” or “Other”.